A culture of productivity, a bold tech strategy, and a drive for new ideas and better solutions fuel a bright future at RE/MAX. 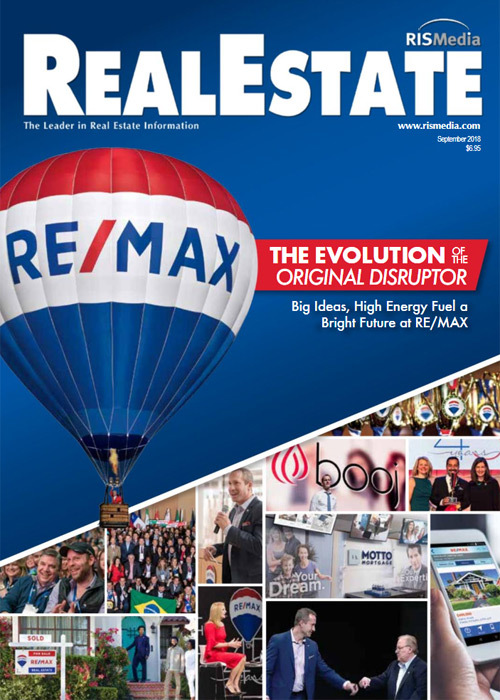 The September 2018 issue of RISMedia’s Real Estate magazine illustrates what exactly makes RE/MAX the premier brand in real estate. Click below to enlarge and read the entire cover story. DENVER – RE/MAX®, the world’s most productive real estate network*, announced its associates once again outperformed agents with other real estate brands in the 2018 Real Trends Survey. For the eighth consecutive year, RE/MAX agents in the survey on average outsold competing agents – averaging more than twice as many closed sales than agents at other participating brokerages. • RE/MAX agents averaged more than double the number of transaction sides per agent when compared with participating competitors. Agents affiliated with RE/MAX averaged 17 transaction sides while agents with competitors averaged 7.5. • The RE/MAX agent average of 17 transaction sides led all national franchises in the rankings including Realty Executives with 11.1, Berkshire Hathaway HomeServices with 9.4, Coldwell Banker with 8.2, Century 21 with 7.8, ERA with 8.8, Better Homes & Gardens with 6.8, Sotheby’s International Realty with 6.6, Keller Williams with 6.6, Compass with 5.2, HomeSmart with 3.9 and eXp Realty with 3.8. • RE/MAX once again qualified more brokerages for the survey than any other real estate brand. The 565 qualifying RE/MAX brokerages represented over one-third of the 1,752 brokerages included in the survey. The closest competitor qualified 392. • RE/MAX agents averaged $4.6 million in sales volume, 78% higher than the $2.6 million average of all other agents in the survey. • When all participating brokerages are ranked by average sides per agent, RE/MAX brokerages claim 89 of the top 100 spots. RE/MAX agents in those brokerages averaged 31 transaction sides. Real Trends Survey 500 ranks the performance of top participating residential brokerage firms in the U.S. Now in its 31st year, the survey ranks real estate brands by transaction sides and sales volume for the previous year. Firms needed to close a minimum of 500 transaction sides in 2017 to qualify for the 2018 Real Trends survey. 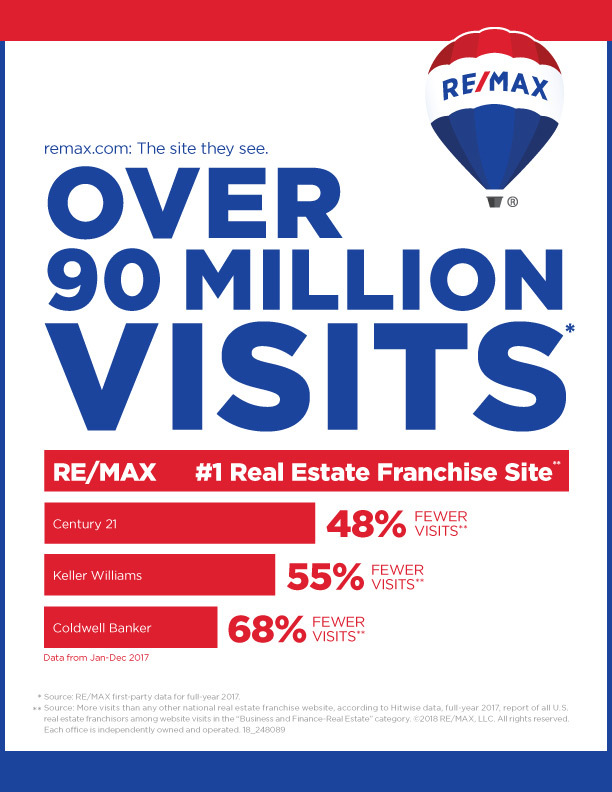 In January, RE/MAX once again held the top position among real estate brands in the annual Franchise 500®survey, also by Entrepreneur magazine. This year’s ranking marked the 15th time in 19 years that RE/MAX has been listed as the top franchisor in the survey’s real estate category. In participating regions, the REMAX Design Center now automatically generates marketing materials for each listing within 48 hours of the MLS being updated. The complete campaigns are delivered straight to your inbox at no cost to you. Read the FAQ or watch this video on RE/MAX University (login required). Four different campaigns market each stage of the sales cycle for your listings, including just listed, open house, price reduced and just sold. You also have the power to customize the materials on the REMAX Design Center. A week after debuting an automated marketing platform for its agents with the marketing company Imprev, real estate franchisor Re/Max is touting the results of another automated tool. Last October, Re/Max gave its agents access to automated marketing through a partnership with the online advertising firm Adwerx. Since then, Re/Max says, the online marketing campaigns generated through Adwerx’s platforms have received 1 billion impressions. Re/Max got 850 million impressions from its usual digital ad campaigns outside of Adwerx throughout all of 2017 in its company-owned markets, or about 70 percent of its U.S. markets. Re/Max is bullish on automation — and for good reason. The Adwerx automated marketing tools are similar to the automated platform Re/Max introduced with Imprev, although the Adwerx platform has more of a focus on hyperlocal ad targeting. The Imprev platform lets agents enter new listings into their multiple listing service and receive ready-to-go marketing materials, including YouTube videos, virtual tours and physical marketing materials like flyers and postcards. Adwerx’s platform auto-generates ads for new listings and places them strategically on websites and on Facebook. The Adwerx platform uses behavioral data analysis to target consumers within 15 miles of the listing and to target consumers who have been searching homes online, who have used mortgage calculators, and who have been buying items related to a new home at big-box stores like Costco. Ryan expects that Re/Max agents will use both its Adwerx and Imprev platforms. While the offerings use similar data analysis and automated tools, they provide complementary services: automated ad creation and automated ad placement across the web. Re/Max made its Adwerx tool available for free to agents for the past five months and will keep the tools available for agents in company-owned regions through June. Independent agents can purchase the service for $36.75 for a weeklong campaign, discounted from Adwerx’s usual $59 weekly price. Adwerx-created Re/Max ads were used by between 90,000 and 100,000 agents on 350,000 to 400,000 listings, Ryan said. The two marketing platforms are part of Re/Max’s efforts — like many big real estate brokerages and franchisors — to become players in real estate technology. Along with its Imprev and Adwerx partnerships, Re/Max announced its acquisition of the real estate tech startup booj last week.